I’m pretty sure you’re not meant to hold a sword like that. 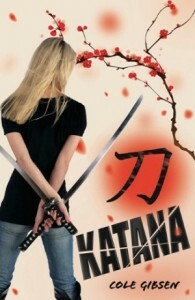 Katana is the second book from American author Cole Gibsen. It blends martial arts with the supernatural in a story reminiscent of films such as The House of Flying Daggers and Crouching Tiger, Hidden Dragon, except without the teary ending. The story follows Raleigh, your average teenage skater-chick (not that I’ve ever known any), as she discovers that she’s a reincarnated samurai with supernatural powers. I’m often disappointed with martial arts books and Katana is no exception. I’m not sure what it is I’m looking for in such a novel, but so far I haven’t found it. It may stem from my own involvement with karate, which I’ve been studying for a few years now, or it may be something else entirely. It started out well with good action and some interesting questions. There was nothing I could fault with the writing, and there were some particularly good lines such as in the introduction to Dr Whats-it (his name isn’t really Dr Whats-it, I just can’t find my copy of the book). In a few lines we know his name and that his presence in the ward was unusual, raising an immediate story question. After the first few chapters everything seemed to fall into mediocrity. There was too much explanation and not enough mystery. I would have liked it better if Raleigh had not gained the memories of her past life until the next book and if the Network (an uber secret crime-fighting organisation) had been a little less nice and lot more secretive. Although I liked the reincarnation idea I was confused when Gibsen kept describing it as possession. Possession requires a separate entity to inhabit your body while reincarnation is an old soul being born in a new body (one that doesn’t have a soul in it yet. Does that mean Frakenstein was a reincarnated?) Was this a case of the reader knowing more than the author intended (Raleigh kept freaking out that thoughts from her past life were taking her over, hence she thought she was possessed), or did the author not do enough research? Raleigh is meant to be a skater-girl (visions of Avril Lavine?) but we never see her do any skating or pull any skater moves. It didn’t both me during the story but thinking back I notice the lack, especially given the detail Gibsen lent to the fight scenes. As a writer I love how Gibsen can set up so much with a single line of dialogue. As a reader I’m still looking for that one good martial arts book. What is it that appeals about martial arts? Is it the fighting, the history, the culture or a combination of the above? My task, I think, is watch a few films such as the ones mentioned above and figure what it is about them I like so much. It certainly isn’t the teary ending.